A comment I often hear about Twitter is “I don’t know how to use it”. Actually, how to use Twitter for business is really quite simple – use 280 characters per tweet to say what you want to say. However, there are some tools and tips to help you get the most of Twitter. It’s not just about broadcasting your contact information. It’s true there’s a lot of noise on Twitter these days and I know of several people who have given up wading through it all. 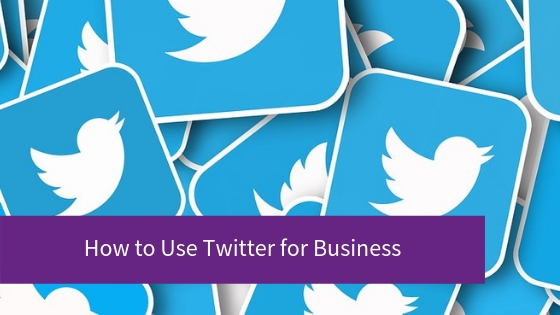 But it is possible to use Twitter successfully to build your business. Below are four of my tips for using Twitter effectively. These weekly chats have become a regular feature of Twitter. Remembering that Twitter is about connecting and having a conversation, rather than just broadcasting, these Twitter Chats offer you the chance to connect with a certain group of people. Twitter hours are events set at regular times and dates which you find and contribute to via a specific hashtag (#). There are many Twitter Hours arranged by location eg #HertsHour #UKHour, by interest eg #BlogHour or #BabyHour and various relating to business in general such as #UKBizLunch and #SMEHour. When taking part, don’t jump straight in with a tweet about wanting clients. Introduce yourself and what you do. Then take time to engage with all the other contributors, including liking tweets and retweeting. Following the #IntrovertsTalkBiz Chat last night, I now have a Pilates instructor interested in what I do. I’ve also arranged a meeting with a local business woman to talk about how we can work together. Search for this hashtag and you’ll see requests from journalists looking for comments and editorial in magazines and press. You need to keep your eye on this hashtag as it’s a busy one and it won’t always bear fruit. Over the years I’ve discovered requests for comments from nutritionists and psychotherapists, advice required from personal trainers and experts on social media. I’ve responded to some for myself and I will often retweet and tag people for whom I think it’s relevant. Another way to use this hashtag is in conjunction with the various awareness days that occur every year. For example, in the run up to and during National Vegetarian Week a nutritionist could tweet several recipes or link to their blogs, mentioning they are available for comment. 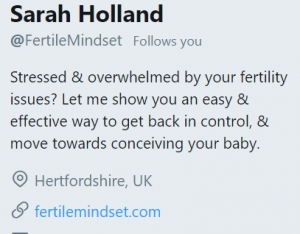 A life coach specialising in stress management could use this hashtag ahead of and on Stress Awareness Day. Twitter allows you to add links to tweets, so you can add a link to wherever you need to drive traffic. This might be your latest blog, your website or landing page. However, it’s not just about tweeting a link. You need a call to action and your followers need to know what the subject matter is. Sounds obvious but if you don’t give a reason for someone to click on your URL then you may have wasted a tweet. The characters in your URL will count towards the 280 character limit that Twitter imposes for each tweet. If you link URL is long then consider using a link shortener such as bit.ly. Make full use of your business profile. Explain succinctly what you do in your bio, making sure your relevant keywords are included. Include a website URL. This could be a link to your website, a landing page for a lead magnet or perhaps your blog. Use your Twitter header image to showcase what you do. A photo of your relaxing treatment room would draw people in or your latest products may spark interest. Corinne Taylor has a beautiful image of one of her products as her Twitter header. Canva is the easiest place to create your header images, allowing you to add your own images and overlay with text. You may also be interested in my blog about using Twitter Lists, a great way to keep your Twitter account more organised. Do you use Twitter? If so, do post your Twitter handle below and I’ll follow you. Any questions about how to use Twitter for business, do let me know below.